Hi ! Haaaaave you met tatt? ~ Smithankyou - Lifestyle and Travel Photo Blog. Hi ! Haaaaave you met tatt? Hi! Haaaaave you met tatt ? Peeps who are following me should know that I got a tatt few weeks back but I am only blogging about it like now. Why ? Cause I kept it from my mum worrying tat she will blow her top. I was playing stealth mode at home by wearing top, covering it with towel. I finally show it to her because I was too tired of hiding and her respond was legend.. wait for it... dary. She went, "fake one right? sticker right ? " Anyway, I got done at black emperor at Bali Lane after looking at Mr.@inrsoul's beauuutiful tatt. And I must say Moon(the tatt artist) is really good. A lot of the tatt shops give me a very intimidating feeling while Moon is very helpful and creative. Let's take a look at some of the pictures of the process before I explains the tatt to you guys. Walking down one of my fav area in Singapore. The Haji Lane, Arab street area. My Buddy Keong was there too ! Moon and I discussing and finalizing the design before it becomes forever ! Done ! - no lah.. kidding.. this is the "sample" stick on. Betty feeling comfortable w the tired keong. We are going to start !! But it's not that bad after all. It's srsly not pain at all. I was like SMS-ing and chatting with the peeps. Hahaha..
*Thanks Christie for coming along and taking all these pictures ! I have always wanted to put a tatt but I just can't get a design for the longest time. No kidding as this thing is for a life time hey. Inspire by Kobe Bryant I wanted a Crown on top of Ah Dum's name- Chris. It means "Top priority" but I do not want a direct "Chris" as it is abit cheesy lah thus I thought of having a "in disguise" thing. 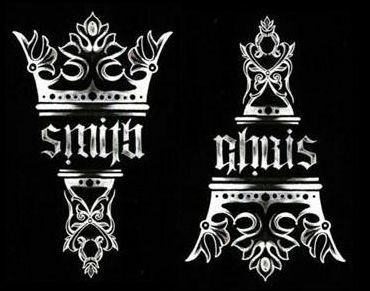 And Moon added a design below which makes the whole design like a shield and the design at the bottom is actually a queen which represent Chris. So the final design is like a King Smith and Queen Chris kinda thing. Guys guys, you do not need to flip the screen. Anyway, the design is superbly nice. Damn good taste lah.. your dumdum and you. wah.. where did u hide urs? gonna show me next time ! !